Blog / Plant Insects / Insect Pests / Want to Get Rid of Your Hemlock Woolly Adelgids? Want to Get Rid of Your Hemlock Woolly Adelgids? The hemlock woolly adelgid is a difficult insect to control because the fluffy white secretion protects its eggs from pesticides. A good time to attempt control it is in October when the second generation begins to develop. The insecticidal soap and the horticultural oil sprays seem to be very effective for adelgid control with minimal harm to natural predators and parasites of this pest. Trees that are heavily infested and are showing symptoms of decline should probably be sprayed. Horticultural spray oil can be applied during the winter and before new growth emerges in spring. 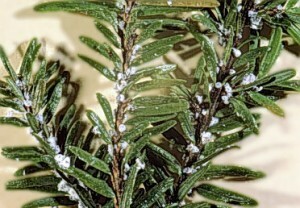 Oil sprays may damage hemlock during the growing season, especially in dry weather. Registered pesticides containing imidacloprid or dinotefuran may be useful for specimen trees located away from water sources. These insecticides are systemic and are often applied as soil injection. Dinotefuran may be applied as a trunk spray. Dinotefuran has a faster uptake, and imidacloprid has a longer residual protection. For additional pesticides, consult the North Carolina Agricultural Chemicals Manual, “Trees and Woody Ornamentals” Section, Adelgids. Researchers with NCSU, in cooperation with the NC Dept. Agriculture and Consumer Services, are conducting biological control strategies using releases of a tiny Japanese lady beetle, Sasajiscymnus tsugae (formerly Pseudosymnus tsugae) in hopes of reducing the damage this pest causes to hemlocks. Scymnus sinuanodulus and Scymnus ningshanensis are two additional lady beetles recently introduced. Laricobius nigrinus, a native beetle from western North America is being tested. Similar programs in other states have shown good results.